Hello and Happy March! I do love March, its one of my favourite months I think. Though it's not officially Spring yet, there's always that feeling of making it through the Winter. The mornings are getting noticeably lighter this week, and the evenings longer. I must say though, we've not had the best start to this month. The kids have both had a horrible sickness bug - at the same time! Not fun. I'm keeping my fingers crossed I don't get it myself. Thank you for your lovely comments on my new blog makeover, I'm really pleased with it. The new look was designed by the very lovely and very talented Claire of All the Adorables. Claire had also designed my previous header and my Etsy shop, which I loved, but was ready for something new and a bit different. 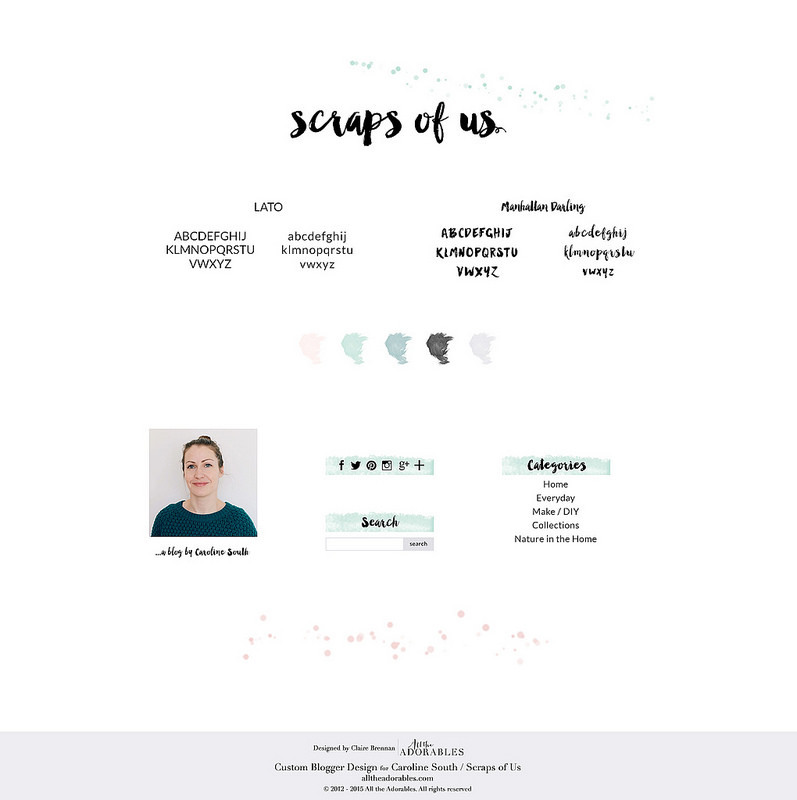 Claire and I started the process by collaborating on a Pinterest mood board, a place were I could gather Inspiration for the new design - colours, fonts or anything that would give Claire a better idea of the look and feel I wanted. I loved the idea of using a watercolour effect and some paint splatters in the design, as well as my favourite colours - turquoise, mint green and pale pink with grey and black. I also wanted a hand drawn/painted title to tie in with the watercolour elements. Follow Caroline South's board Blog design on Pinterest. Claire found this great hand written font, which I love, and created a brand board incorporating the watercolour graphics and colours we had decided on. This was a great way of seeing them all together before starting on the actual blog design. We opted to keep the colour scheme pretty simple, using mainly the mint green. Though we did manage to pop in a little pink, with some paint splashes at the foot of each post. I especially love the textured watercolour backgrounds Claire made for the side bar, they keep it all nice and cohesive with the width too! You can find more of Claire's design work here and her gorgeous blog here! I am loving your new blog look! That header is amazing. Love the font, and the colours. It reflects your stylish love of the sea really well.